"This is a family recipe that I make all year long! A family favorite! This recipe is AMAZING! I make several loaves and freeze it. It's just as good after it thaws out as it is the day it's baked. I also shred zucchini from my garden and put it in 2-cup portions in the freezer for fresh bread all year round." Beat margarine, sugar, cinnamon, and nutmeg together with an electric mixer in a large bowl until light and fluffy. The mixture should be noticeably lighter in color. Add eggs one at a time, allowing each egg to blend into the mixture before adding the next. Beat vanilla extract into the margarine mixture with the last egg. Mix flour, cocoa powder, baking powder, baking soda, and salt in a bowl. Pour the flour mixture into the margarine mixture alternately with the milk, mixing until just incorporated. Fold zucchini through the batter, mixing just enough to evenly combine. Pour batter into 2 loaf pans. Bake in the preheated oven until a toothpick inserted into the center comes out clean, 40 to 45 minutes. Cool in the pans for 10 minutes before removing to cool completely on a wire rack. This is okay, but a little bland. 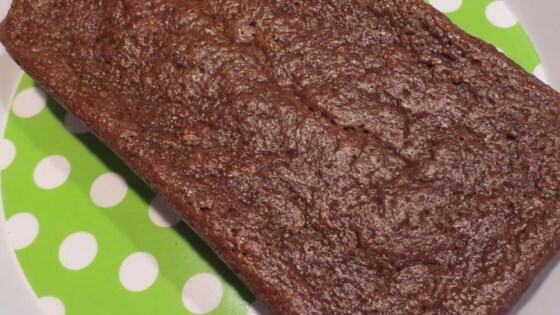 Excellent quick bread! Nice and chocolatey, and moist.